The 2013 stakeholder report is up over on the SJ Games website. Whether you are a fan of SJ Games products or not this offer a unique insight into the operations of a game company with commentary on the industry by one of the oldest of the old school game designers. Where is Glasstaff? The 5e adventure continues. This week the search for the Lost Mine of Phandelver was continued. Josh wasn't able to make it but +Daniel McEntee returned. 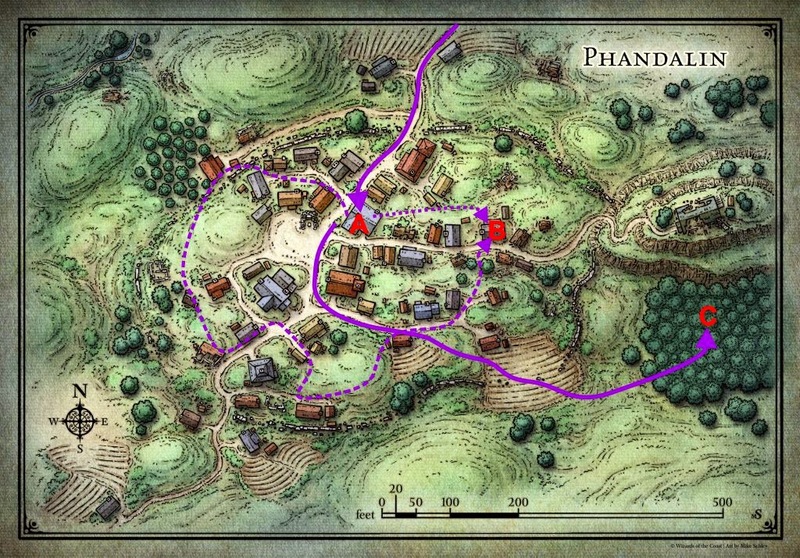 He joined +Tim Shorts, +Chris C., and +Joshua Macy in their adventures around the mining village of Phandelver. We last left the party at their victory over the Troll Skull Goblins at their hideout. Now they are ready to return to Phandalin and enjoy their hard one spoils. The party returned from the goblin hideout (G) to Phandalin without incident. Along the way they chatted with Sildar Hallwinter and learned the following. He was travelling here with Gundren Rockseer when they were both captured. Gundren was sent to the Troll Skull "castle" along with all their gear including a map to Wind Echo Cave, the site of the Rockseer mine. There are three brothers, all Rockseers, that are involved. Klarg, the orc leader of the goblins, had orders from somebody called the Black Spider to waylay them. The Rockseer are involved with Iarno Albrek, a magistrate recently sent by the Overlord from City State to take charge of Phandalin. Sildar is Iarno's man at arms and hasn't heard from him in several months. Decided to come with Gundren to see what happened. With the time near sunset they decided to turn in at the Stonehill Inn. Sildar bade them goodnight and told the party that they can find him staying with Townmaster Harbin at the village hall. That they should come and see him in the morning to decide what to do about finding Gundren. During dinner the party learned of the death of Thel Dendrar a local woodcarver along with his wife and two children were missing. Thel was murdered by Redbrands while they looted his cottage. Outraged Ara and Vognur talked to the farmers and learned that his wife and children were likely taken to be sold in the slave pits of the City State of the Invincible Overlord. Also the party learned that Pip,, the innkeeper's son, had a friend, Carp Alderleaf, who saw the bandits emerging from a secret tunnel. As dinner was winding down, Vognur spoke to the innkeeper Toblen, and assured him that the group will do something about this. Only keep between the two of them to minimize the chance that the Redbrands will overhear something. Vognur also graciously refused the return of the money the party spent on room and board. With that the group retired for the night. All that is except for Sidwin the Sharp. The thieves of the Brotherhood of the Lion are many things but being slavers is not one of them. As Sidwin went out to "stretch" his leg and made his way over to the Sleeping Giant. A known hangout of the Redbrands, he stealthed his way to a window and overheard four of them drinking and talking about the murder of Thel and the loot they found. The rogue also took note of Grista, the tavern's proprietor, a dwarven lady that looked as mean as her clientele. However luck wasn't with Sidwin as he walked over a pile of rotten firewood when attempting to leave. It was just enough noise to cause one of the Redbrands to investigate. Caught in the open with nowhere to hide Sidwin played dumb and drunk. Luckily his wit and fast tongue allowed him to join the Redbrands in a game of craps. Luckily while he did well, one Redbrand did better, the best outcome for a newcomer in a gang of thugs. Sidwin also learned that the leader of the Redbrand was a mage named Glasstaff. By the middle of the night with nearly all the ale gone, Sidwin was trying to leave. But Grista was having none of that. 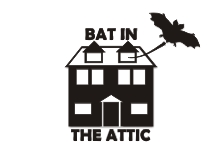 She insisted that Sidwin enjoy her tavern's hospitality with a tossed bedroll and heavy crossbow pointing at his groin. Unlike the humans of the party, the elves only need a four hour trance to refresh themselves. Returning to full awareness after midnight Ara and Keyar noticed Sidwin missing. It was decided that Keyar would do a sweep of the sleeping village to find Sidwin. After two hours, following the dashed line to B, Keyar peered into the window of Sleeping Giant and found Sidwin sleeping along with the Redbrands. Returning to Ara they decided to wait until an hour before sunrise and wake Vognur to attempt a rescue. There was some discussion on whether Sidwin had abandoned the party to join the Redbrands. In the end was decide it made no difference to what needs to happen. Vognur was awakening and in the gloom of the pre-dawn twilight, the warrior readied himself. The three crept through the gloom and positioned themselves around the Sleeping Giant. Ara acted first and let loose with a sleep spell. Taking care to position it so it wouldn't impact them. One of the Redbrand was effect and to everybody surprise Grista and her crossbow came tumbling down the stair. However the remaining Redbrands were still sleeping off their ale and all five were dispatched. Sidwin explained what was up and the party resolved that the time to strike was now. The group returned to the inn, where with innkeeper Toblen permission they had Pip fetch his friend Carp. From Carp they learned that the tunnel was in the forest south of the ruined manor. (point C). Everybody readied their gear and prepared to leave. During this Lanar was waken and also geared. Matilda stayed at the Inn and took charge of cleaning and mending what they didn't take with them. Arriving at the tunnel entrance in the party found a long narrow tunnel leading into the earth. With Keyar in front leading with his preternatural elven sight the ventured downward. After several hundred years the tunnel opened up into a large open space. With everybody hanging back in the tunnel. Keyar ventured out. (To point A) From behind the stone column a horrid man sized creature stepped out. Almost immediately the Ranger was drawn to the monster's strange singular eye. As it filled his vision the elf felt his spirit come under attack! As necrotic energy filled his awareness Keyar remembered the forest vaults of his home, the threads of life he could feel throughout the streams and trails. Wrapping the memories of winter beauty around like armor the monster's hold was broken! As the ranger raised his longbow, he focused on the creature's aura and placed his hunter' mark. Alas the arrow ricocheted off of the creature hide. However the rest of the party galvanized into action. Between Sidwin's bow and rapier, Ara spells, and Vognur's blade the four downed the Nothic screamed his death knell and fell to the ground. From as distance the party heard "Brak nathag ock besarg ot mandan Nothic.". Fortunately Ara was able to understand this as it was goblin. "Go check and see what the nothic is up too". After this a plaintive voice replied "But why me?" followed by a bellow and somebody opening the door. Note: Understand after this point it all one continuous stream of combat. The lull after the Nothic death was the last lull for a long, long time. The party positioned themselves around the lower hallway. (along the line pointing to B) The door cracked open and out stepped a Troll Skull goblin! On the edge of Phandalin no less! The Keyar focused his Hunter's mark on the unsuspecting humanoid and killed him with a single arrow shot. A second later, an orc steps halfway out and stooped to examined the fallen goblin. When he turned to look up the stair, he saw the flash of Keyar's second arrow and slumpped against the door jam with an arrow in his shoulder. Vognur rushed forward and slashed the large orc across the arm. Unfortunately Sidwin missed his shot while Ara kept watch toward the large cavern. Aided by his Hunter's Mark Keyar scores a perfect hit (another nat 20!) and the orc collapses dead. The remaining orcs rushes out and the first feel feels the bite of winter as Ara successfully aims a Ray of Frost spell. The orcs fights the party but to no avail. The last orc desperately grapples Vognur only to be cut down by a well aimed sword thrust. This how it looked from Vognur's point of view. During the fight with the last of the orcs, Sidwin hears people scrambling from chairs and readying themselves. Taking notices of the door behind him (the one south of D) He makes the rest of the party aware of the situation. The party slams open the door and rushes into the room (point D) Unfortunately two Redbrands were waiting in ambush and hacked into the party as they rushed through with Vognur bearing the brunt of their blows. As an unpleasant surprise they proved to be far more capable fighters then as the thugs they first appeared to be. Ara hearing the sounds of doors opening decides to go back and up the stairs and keep watch. A move that proved wise later. Vognur, Keyar and Sidwin battled the two Redbrands around the room downing both of them. Unfortunately Glasstaff choose to make his appearance. (Standing at point E) Framed by the two doorways Vognur made a perfect target and he was felled by a volley of magic missiles. The dice that downed Vognur. During this a third Redbrand make it way through another hallway and into the cavern. Ara and the Redbrand spotted each other at the same time and the mage retreated down the stairs into the lower hallway (point A) yelling at Lanar to follow him. Lanar ran as fast as legs could pump but the Redbrand was quick. In a vicious cycle of swings, the thug cut down Lanar and gave Ara a vicious slash across the chest. Keyar was the first to react to the appearance of Glasstaff and focused the Hunter's mark on the mage. But the well aimed arrow shot was foiled by the shimmering globe of magic energy that sprung from Glasstaff's staff. In a single fluid motion, Sidwin lunged his rapier at Glasstaff. The magical shield was no match for Sidwin's skill as the rapier slipped through the mage's liver. With nothing between him and the Rogue, Ara unleashed his most potent spell sleep. The looking of triumph on the Redbrand's face quickly turned into deep slumber as the thug collapsed onto the stairs. 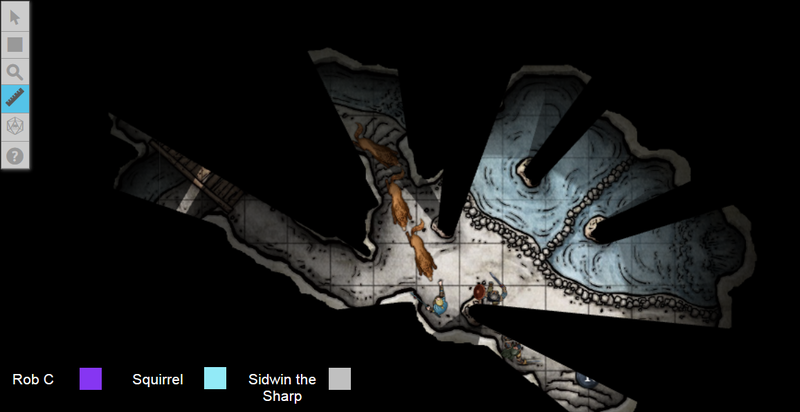 Stunned by the display of the wizard's power, Sidwin elects to run into the open doorway to the east. (The room and door to the east of E). Seizing the opportunity, Glasstaff stuck out with his staff but failed to hit. Seeing Vognur getting up and Keyar readying his bow, Glasstaff chose to run away through the upper hallway. (The path to point I). After stumbling in the dark hallway, Sidwin lets Keyar lead and the two give chase. Vognur decides to grab the torch in the wizards room. (point E). In the mean time Ara is disparately trying to stop Lanar's bleeding before he dies. From Vognur point of View. This is what it looks like from my end. With the glow from the upper storeroom to guide him (point I) Sidwin leaps! 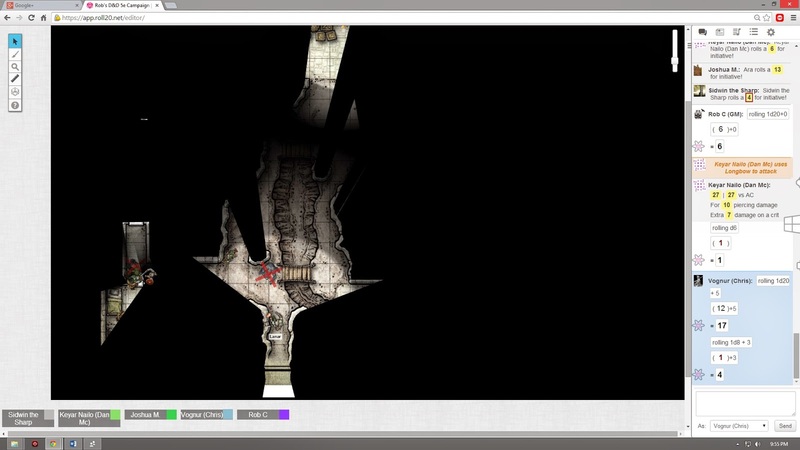 across the chasm and runs down Glasstaff desperately trying to open a secret door. (also point I). However Sidwin's rapier blows was not to be as it completely missed the wizard. Once again a well placed shot by Keyar was foiled by the wizard summoning another shimmering shield from his staff. With a sneer at Sidwin, the wizard lets loose another volley which downs the mighty rogue. Then slips through the now opened secret door. Ara and Vognur see Keyar gives chase to the wizard as the elven ranger also slips through the door. Unfortunately Keyar is brought up short when he spies three skeletons rises from their crypts in the subsequent room. (point H). He could only curse his frustration as the wizards slips through the double door to the east. Deciding that discretion was the better part of valor. He slams the door on the skeletons and spikes it shut. He returns to the party as Vognur skillfully bandages the multiple punctures wounds on Sidwin. Wow, this is was simply the most awesome DnD fight I refereed since a ADnD first adventure in my first year of college. I am sorry but unless stealth is involved or a one round kill there is no way that the party isn't going to rouse the rest of the western half of the dungeon if they fight the Nothic. This happened for this group and the J Squad at Gold Star Anime. Now the awareness of everybody in the western half didn't happen all at once. I was rolling perception checks particularly for the Redbrands. Despite managing to blow a total of eight rolls while playing their card game they still managed to put together a credible defense and warn Glasstaff. OK this part may not come off clear. It about initiative. I had everybody roll initiative and divided the groups into those that went before the monster and those went after. With four players most were in all one group. Then I resolved initiative in order of who is closest to combat. This cut down a lot of "I am waiting for X to do something before going.". 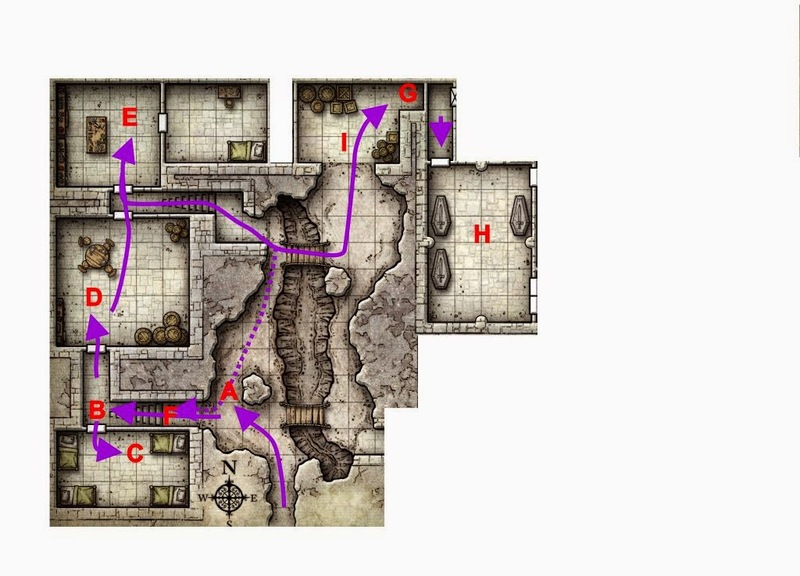 Which happens a lot in dungeons with 5' corridors. DnD 5e is really growing on me. Like Tim of Gothridge Manor, I think the healing mechanisms are too generous but... well I have to admit if you are going to have this type of mechanic this is the way to do it. Note that the party hasn't touched their hit dice healing. They simply have had time too. I did get one thing wrong, attack of opportunity only occurs when you exit your opponent reach. So Sidwin could have run around without drawing opportunity attacks. A six second combat round is pretty abstract so I can buy this. In my Sword and Wizardry games I always allow a 5 foot step with out any type of opportunity attack. I just chalk it up as part of the dancing around that occur in real life combat. However you still need to be aware when two opponents are standing side by side. Ranger having Cure Wounds is awesome. I know Dan thinks so. As a fan of the Dunedain Rangers I think it cool as well. Glad to see this in place over the concept of the Ranger as woodsy guy, two weapons fighter of other recent editions. Also the party doesn't quite suffer from the lack of a cleric. Yeah having a cleric would be very helpful but there is just enough surges, potions, and hit dices that a cleric-less group can keep going. For a little while at least. There is only one bad point and that is the choice of skills. 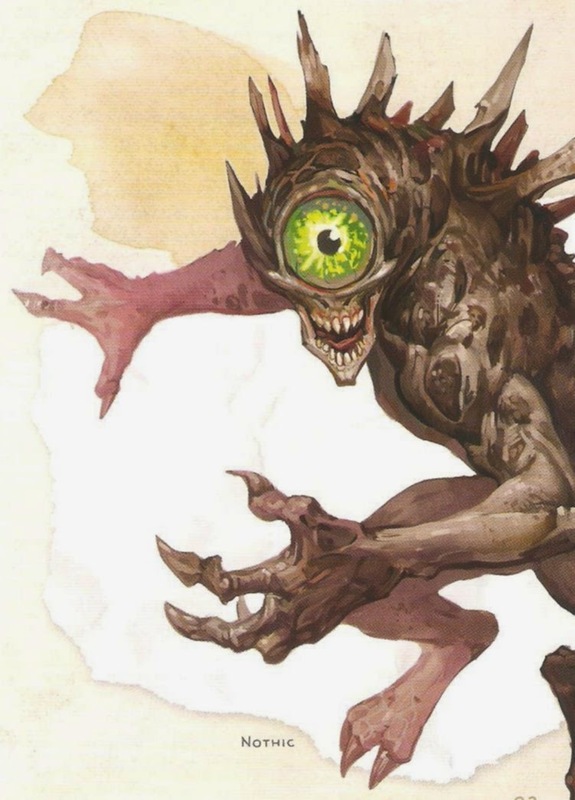 Perception seems to be the "tic" skills of DnD 5e. We fumbled around with Insight and Investigation as well. I will read them over again before I make my final impression. 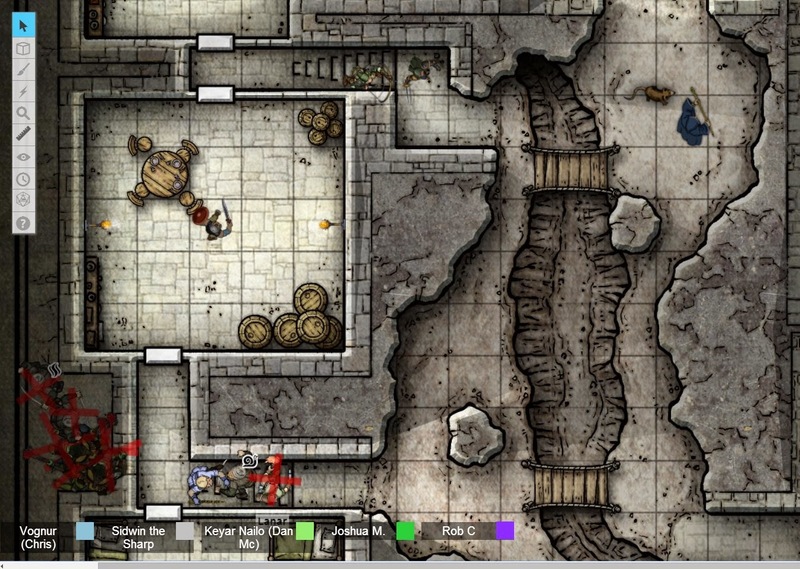 Roll20's Dynamic lighting is awesome. Tim did really fumbled around and lost some movement tying to figure out where Glasstaff went. I never seen that in tabletop before. Also I was able to speed it up by checking Update only on Drop. Magic Missile dice have a happy feel. Magic Missile was Glasstaff "tic" spell. Blew two of them through his 2nd level spells slots and two through his first level. The spell slot system is outstanding. It not like the involved decisions of DnD 4e or GURPS, but there are tactics involved in deciding to use what spells where. Damn I hope Wizards doesn't flake out about third party publishing I want to write for this. That all for now the next adventure post will be in two weeks. Some basic Majestic Wilderlands Info. I posted about this way back when I first started writing my blog. With a couple of new players in our Monday Night group, I figure it would a good time to post a reminder that I have some Majestic Wilderlands info up on the web for free. And it is especially useful if you want to run the setting with GURPS. Well it been a journey but thanks to the hardworking folks at Autarch, the Dwimmerount megadungeon is finally released for Labyrinth Lord. The ACKS version is being worked on and will be released later this year. This is because the original Muntberg used by James was the Keep on the Borderlands. And the Keep was based on a real world castle. So I figured what good for Gygax is good for Dwimmermount. The text and maps of Dwimmermount are all open content. So those who have a better way of presenting the place or problems with specific can share their fixes. My only major criticism of Autarch's work is that when they split the maps for the map booklet they didn't overlap them by 5% or so. They tried for a perfect splits which doesn't work in practice. This is the same flaw the afflicts the maps for The Castle of the Mad Archmage. In both there is plenty of white space on the outer edge to allow room for extra overlap. D&D 5e Basic Rules Updated! The Basic Rules have been updated to include two new spells and added some appendices More important there is now a Dungeon Master PDF with encounter building guildlines, monsters, and magic items! Not a complete list by any means but enough to get started. One thing I noticed right off the bat in the DM guidelines is that there a section of what are in essence NPC templates. You combine those with the race or humanoid monster of choice and you have a fleshed out basic NPC. This week the goblin cave near Phandelver was assault. Joshua Macy and Dan wasn't able to make it but Joshn or +Rhandom A returned. He joined +Tim Shorts, and +Chris C. outside of the entrance of the goblin cave. Last week's adventure was a grind to get to the cave. But finally the party is standing outside of the den of iniquity known as the Goblin Hideout. When we left the party they were standing outside of the Goblin Hideout having killed two sentries. Having captured a goblin patrol in the previous session they knew that there was sentry over a bridge. That if the sentry raised an alarm a dam would be busted and the resulting deluge sweeping any invaders out of the cavern. Electing to enter the cavern without any torchlight, Vognur and Sidwin relied on their own limited vision while Squirrel used his superior Elven vision to guide them. At first startled by snarling wolves they soon saw that they were chained. Sidwin quickly threw in two days worth of rations to quite them. Apparently goblins were used to the noise of the wolves as they did nothing but shouted for the wolves to quit down. With Vognur hanging back the party spotted the bridge. Squirrel attempted to carefully climb up the wall but failed to find any handholds. The resulting noise alerted the goblin sentry on top of the bridge. Luckily Vognur heard the goblin moving out onto the bridge and drawing his bow. He rushed forward and in the dim light could see enough of the goblin to throw a hand axe. His hit staggered the foul creature leaving him bloodied. Reacting quickly Squirrel turned around and with arcane syllables and mystic gestures a icy ray of frost enveloped the goblin. Overcome with cold he fell to the bridge. The bow falling into the stream 20 feet below. 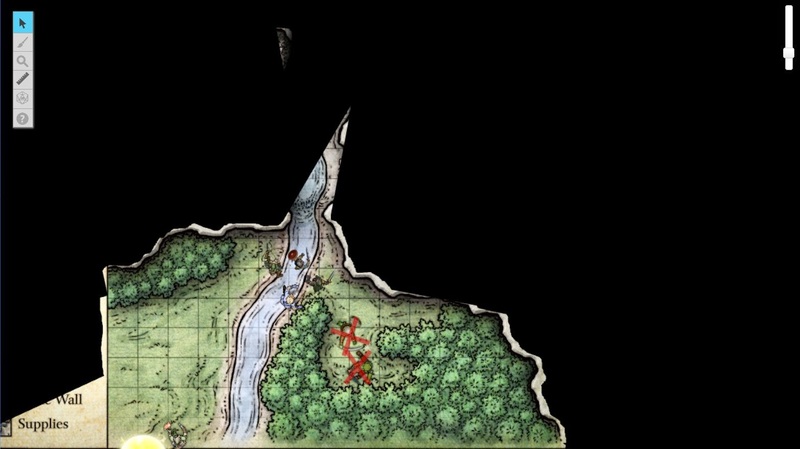 Just as the party finished climbing up to the bridge a goblin from the upper cave pools arrived at the bridge to investigate. Squirrel reacted quickly and with a pinch of fine sand and single breath put the goblin to sleep. The goblins throat was slit as the group proceeded into the upper cave. Thankfully a single torch burned on the cave wall. Making the place bright enough to reveal two pools of water that were clearly the result of a dammed up stream. Also more light spilled from a southern entrance where the sound of an orc, his pet wolf and several goblins could be heard eating and talking. Note: That in the Majestic Wilderlands I don't have a multitude of humanoids races. I pretty much used only orcs and goblins. In this case the orc had the same stat as the original bugbear. Quickly a plan was devised. Squirrel waded out into the pool and jammed the mechanism to break the dam and release the deluge. On his return, Sidwin poured oil all over the steps leading up to the southern entrance. Then with everybody in position he scattered ball bearings across the steps. The noise of dozens of tiny metal balls attracted the attention of the orc and goblins. One of the goblins rose to investigate. Not noticing the oil and bearing he stepped on the stairs and immediately began to slip and slide. Luckily he managed to recover from falling when he reached the bottom of the stairs. Unluckily when he lifted up his head to look around he promptly met the edge of Vognur's blade. His head half severed the goblin fell to the ground dead. Boy Vognur you really wanted to axe that Orc a question. Then promptly followed up with a Ray of Frost that left the chief rimed in frost. Seriously you named your wolf, Fido? Despite the unfortunate name, the wolf did his master proud and lept onto Vognur. The beast's teeth ripping ragged wounds across the warrior's body. (A natural 20 for the wolf). The ferocity of the wolf's attack did not unnerve Squirrel as the elven wizard enveloped the wolf with his Ray of Frost spell. Unfortunately Sidwin subsequent rapier attack did not found its mark. Desperate Vognur hacked away at the beast and scored the hit that brought it low. With the party exhausted from the battle, Squirrel extinguished the campfire in the orc chief's cave with a gesture. From behind him he heard Sidwin's voice. Great like we can see well to begin with. Luckily a single torch still burned in the upper cave. Resolved not to be without light, Vognur put away his shield and grabbed the torch. Sidwin crouched in a alcove in the cave wall and drunk a potion of healing. Suddenly was the sounds of a pack of wolves let lose and the orc chief's booming voice raising a hue and a cry calling the rest of the goblin to attack! From one of the entrances burst out the wolf pack. Thinking on his feet, Squirrel distracted two of the three wolf with the sounds of a angry bear behind them. However the wolf he didn't distract was the one closest to him. Scrambling out the way, the wolf clawed the Wizard and knocked the elf to the ground unconscious. Vognur with sword and torch in hand attacked and left gash across the wolf's flank. In vain the wolf tried to bite Vognur. Sidwin's rapier slew the leading wolf. Vognur's followed up a with gash that nearly killed one of the remaining two wolves. However no longer distracted by the sound of a bear attack the remaining two wolves flanked Vognur. In a full display of their age old command of pack tactics, the two wolves maneuvered Vognur badly out of position. In two lightning swift attacks the braved warrior lost his cod piece and fell to the ground dying. Sidwin stood alone. Behind the wolves the remaining goblins of the hideout rushed into the upper cave with their bows drawn. Summing up his last reserves, Sidwin shouted. Wait! Wait! Don't do this, Klarg will be pissed as I brought the beer. Immediately sheathing his weapons, Sidwin carefully explained in halting common and goblin that he brought beer for Klarg and has no idea of what the hell is going on. The goblin leader sent back a runner to get Klarg. 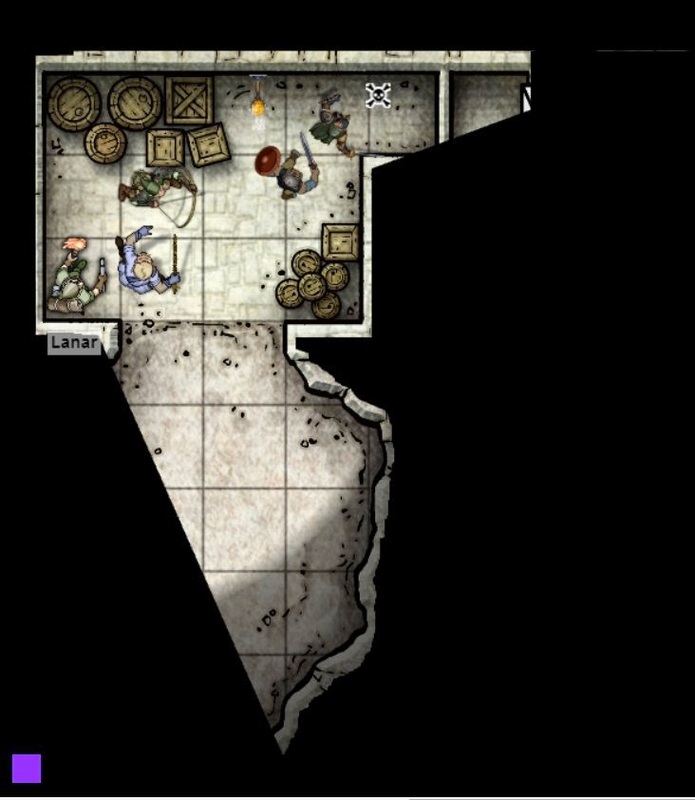 Apparently the orc leader escaped through the fissure in the back of his room, released the wolves, and sent the remaining goblins in to attack the party. Note: Tim rolled only a 14 for Sidwin's persuasion, but I rolled really bad for the goblin's gullibility (a 2 -1 = 1). This part was memorable because I just saw Guardians of the Galaxy. For a second I had an intense desire to hear Tim say "I am Star Lord" after the goblin asked him What?. While this was going Squirrel's bleeding slowed and stopped. Then in a miracle, Vognur's eyes fluttered open. After taking note of the goblin and two wolves nearest him, he gathered in his reserves for a second wind. With a shout, he stood up and downed the injured wolf, surprising everybody. This sudden onslaught broke the morale of the goblins as Sidwin and Vognur pressed the battle. Not the last remaining wolf raking Vognur's arms could stop the slaughter. The goblin's doom was sealed when Sidwin managed to revive Squirrel with the last remaining healing potion. Unleashed the fury of Burning Hands the last of the goblin died in magefire. Hearing a human crying out in pain, the group rushes the last unexplored room. There they found a goblin holding a human prisoner hostage. However a display of the party magical power broke the creature's morale. He pushed the human down the ledge and tried to run. Once again with a pinch of fine sand and a breathe Squirrel ended ... everything. A minute later everybody started to wake up from the close range sleep spell. Luckily Vognur woke first and killed the groggy goblin. Luckily the human didn't die from the shock of the fall and was stable. The party looted the complex finding two more healing potion, some coin, and a strange statuette of a frog worth 400d (sp). After a hour long rest, the prisoner woke up. As it turns out he was Sildar Hallwinter on his way with Gundren Rockseer to Phandalin. Silder was to take service with Iarno Albek the recently appointed baliff of the town. On the way there, they were captured by goblins. Gundren was sent to the chief of the Troll Skull tribe along with all their gear and possessions. Including a map of to the Rockseer's mine at Wind Echo Cave. After the rest, the party released they did not find Klarg's body. Searching the immediate area they found a bloody trail leading into the surrounding woodlands. They left Sildar with Lanar and Matilda and went off in pursuit of the orc. After first they ran into trouble with a stretch of forest that was wrecked by a recent storm. Sidwin and Squirrel made it through easily but it took a while for Vognur to force his way through. Pressing onward faster the party did not notice a rattlesnake in their path. Sidwin and Squirrel were able to quietly avoid the rattlesnake. Confident in armor, Vognur ignored the snake. This proved his undoing as he got bit. Too ill to continue, the rest of the party forged on. Luck was on their said as they found the former orc chief being plagued by bees. The orc tried a valiant last stand but fared no better than Custer at Little Bighorn. Note: I used one of favorite gimmicks Paizo's chase cards. With that final bit of business wrapped up the party headed back to Phandalin. The death save mechanism steadily grows on me. Now that I have experienced its use in several session I feel adds a great deal of fun to the otherwise unpleasant situation of character death. And the revive to 1 hp on a natural 20 is pure gold for generating unexpected turn of events. This was the first session with my new Player's Handbook. The book makes for an excellent reference during play. Although the index text is incredibly small it is complete and I found everything I was looking for quickly with it. One thing that saved party this adventure was the fact they killed several sentries and patrols over the last two sessions. The failed first run proved crucial in whittling down their numbers for the successful second run. Roll20 dynamic lighting and line of sight was awesome. But the big down side was it really bogged down Roll 20. When I switched it off for the party to loot the complex everything was way faster. I am going to need to do some reading on how to efficiently setup dynamic lighting. One thing I was able to do was setup elven vision as distinct from how the human see things. Squirrel had a much easier time of it then the rest of the party. So next week is back to Phandalin. See you next time! 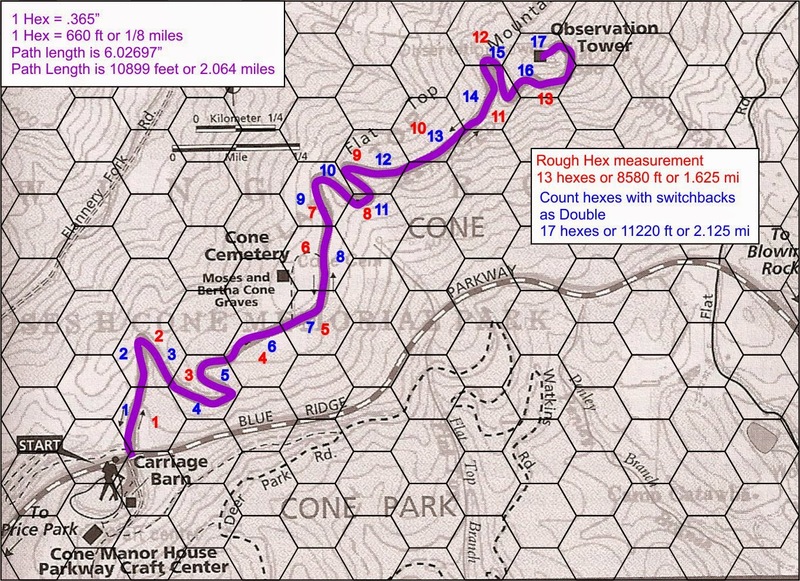 Are hexes just traditional for hexcrawls or do they allow for fast and accurate measurements of distances? Take a look at following image. This is a real world map with a winding path to the observation tower. It as a small scale so we are forced to use an odd measurement for a hex. One-eighth of a mile or 660 feet per hex. When I drew this over top of the image it each hex measured from top to bottom 0.365 inches. The purple path I drew over the original map path measured 6.027 inches. Making the true length of the path, if you hiked it, 10,899 feet or 2.06 miles. At a game table you could have a device with a wheel that you could roll along to measure the true length of anything on the map. But that not a common piece of equipment a person is likely to possess. The virtue of a hex grid is that from each hex there are circles of hexes surrounding it out to an arbitrary distance. This makes it very useful to measure distance quickly from a center hex to an arbitrary point. So what if you have a hex filled with winding paths inside the hexes. Well if I counted up the hexes that the path touches it comes out to 13 hexes or 1.625 miles. (the red numbers) Not very close to its true distance. However if I double counted (or even triple count) hexes (the blue numbers) with particularly convoluted paths. Then I get about 17 hexes or 2.125 much closer to the true distance of 2.064 miles. Like any tool you need to use your best judgement in using this. In this case you need to estimate by sight whenever a convoluted path inside of a hex means you double or triple count it. Went up to my FLGS last night and picked up a brand spanking new 5e Player's Handbook. There is no great revelations in this over the 5e Basic PDF. The main additions as far as I can see that this point is expanded everything (races, classes, spells, etc. ), multiclassing rules, feats, and an appendix of stats for creatures that are relevant to various classes. Like familiars, druid animal forms, etc. The actual rules themselves pretty are what they are in the Basic PDF. So Wizards wasn't kidding when they said that the 5e Basic PDF is the same game. In 5th edition, your attributes give a bonus. When you try something you roll a d20 equal to or higher than a target number. If it is combat the target number is armor class. If you are in advantageous situation you get to roll twice and take the highest roll. If you are at a disadvantage you roll twice and take the lowest. If you are proficient in a weapon, tool, or skill you get to add a bonus based on your level. Hit points are considered a measure of fatigue as well as injury and every character can "take a knee" for an hour and regain a small amount of hit points. The ability to "take a knee" erodes unless you have extended downtime. As you level you have the option of increasing your ability scores or taking a feat. Saving throws are based on the six attributes and rolled using a 1d20 equal to or greater than a target number. Combat rounds are six seconds, and consist of a move and a action. If you roll a nat 20 you double the dice of damage rolled (not the bonuses). If you rolled a nat 1 you missed. Spell casting has slots that you use up during the day and are only reset after a 8 hour rest. You don't memorize specific spells for specific slots. Instead you prepare a limited list of spells that you can cast from during the day. Many spells are designed to be cast through higher level spell for greater effect. For example there is only one cure spell which heals for greater amounts when cast through a higher level slot. The rest are class details which are as about as complex and detailed as ADnD 1st sub classes like the Druid, Monk, or Ranger. To hit bonuses and Armor class have a limited range and are scaled on a absolute scale rather than by challenge level. This is called bounded accuracy. Higher level creatures and character are tougher because they have more hit points, do more damage, in more ways, and have more chances of attacking. They (only) made it to the Goblin Cave, another D&D 5e tale. This week the search for the Lost Mine of Phandelver was continued. Josh wasn't able to make but +Daniel McEntee returned. He joined +Tim Shorts, +Chris C., and +Joshua Macy in their adventures around the mining village of Phandelver. Last week's adventure was a near party kill. But the group rallied back and managed to get Gundren Rockseer's supply to Phandelver. After a good night's rest at the Stonehill Inn, they were ready to return to the ambush site and track down those nefarious goblins. During breakfast at the Stonehill Inn the party met Keyar Nailo. After finding out their mutual interest in killing goblins they agreed to join forces. During the breakfast they discussed finding a hireling to carry their stores and any treasure they found. Talking with Toblin Stonehill the innkeeper they hired Lanar a local miner down on his luck. Then it was off to Barthan's Provision where an assortment of iron spikes, and other equipment was purchased including two healing potions. With a confident air the party returned to the ambush and found the trail that the goblin ambushers used. They avoided a basic snare trap, but Keyar missed the pit trap on the trail while scouting ahead. Confident of the trail's safety Vognur fell through the flimsy screen on top of the pit trap suffering several severe bruises. The party rested and continued to follow the trail. Finally by noon they spotted a cave. (G on the map above) From the heavy traffic leading to it, it could only be the goblin trail. Sidwin used his skill in stealth, honed in the back alleys of the City State of the Invincible Overlord, to sneak up to the cave entrance. However he failed to notices the goblin sentry watching him. Nor the other goblin sentry who was creeping along and at his back. Probably why Sidwin got away from the alleys of City-State. The goblin stabbed him in the back running him through his spleen. With the blood gushing out of his mouth muffling his cry, the rogue collapsed to the ground. The other goblin took aim at Keyar, moving carefully up the left bank of the stream, and shoot an arrow through the archer's thigh. The wounded elf couldn't react fast enough and the two goblin sentries fired their arrow into him. One arrow pierced his shoulder and the other his stomach. The archer collapsed, his life bleeding onto the ground. Keyar has successfully passed his Boromir audition. Nearly stunned by the sudden onslaught, Ara pulls himself together and rushes up to the stream. Through force of will he draws in the ambient mana and sends it hurtling through memorized arcane forms, directing the spell with his hands towards the two goblins. With a noiseless cry they fall to the ground in a deep slumber. 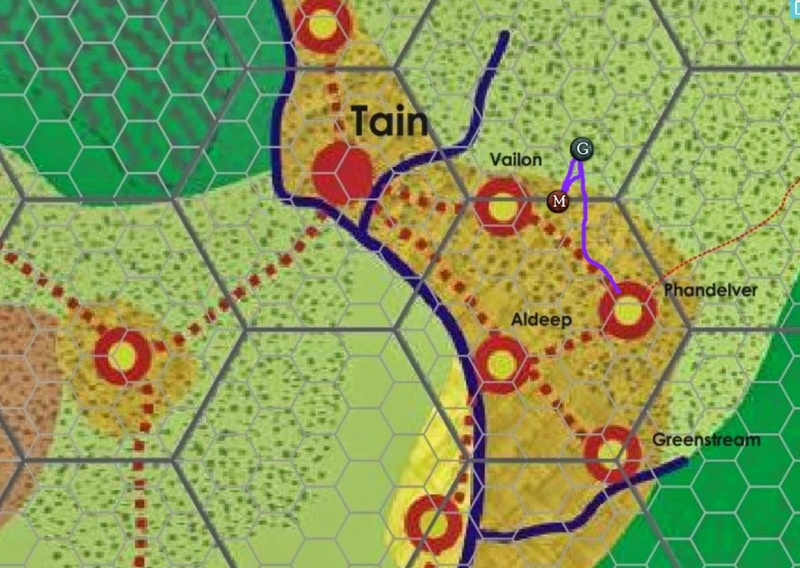 With victory at hand, Ara steadies Lanar and with Vognur manages to stabilize their fallen comrades and bore them away before the goblins could come out and investigate. Along the way the goblin awoke but a timely Shocking Grasp spell put an end to any escape spell. Luckily they were only an hour's walk away from civilization and manage to stumble onto a peasant's cottage. There in the toft (the enclosed yard around a cottage) the party recuperated. Ara questioned the goblin harshly and managed to convince that he was the Dark One personified. The goblin quickly babbled all that he knew. That the cave was home to many goblins led by a fearsome Orc named Klarg and his second in command Yeemik. That the hideout consisted of a long cave alongside the stream. At the top of which are dammed up pools of water that can be released to sweep out any invaders. To the right of the entrance was a wolf kennel. On the left was a little used rubble filled passage leading to the main goblin quarters. There also a bridge over the long the cave. The bridge could be accessed by going to the end of the cave, up some stairs to a room. Off of the room was Klarg quarters and access to the bridge. Beyond the bridge was the main entranceway to the goblin quarters. During this the party spotted two peasant (a man and a child) returning to the cottage. The peasants spotted the party and ran in the direction of the local manor. Everybody except Ara climbed a ridge to keep an eye out. Ara soon learned that the goblins were holding a human captive and that they sent a dwarf to the tribe's castle. When Ara joined the party and relayed all that he found, the group spotted a small party of peasants being lead by a warrior on horseback. As the warrior approach they could see he was a small thin man and his chainmail armor was ill-fitting. Then quite unexpectedly they were greeted in a high pitch whiny voice. "Who are you and what are you doing on my land.". The party explained their mission and what they were doing. The warrior was Sir Varius, the lord of Highgarden Manor. (M on the map) The knight went to see the goblin. The creature tried to escape during Ara's absence but got tangled up in the hedge. The knight looked at it with contempt and proceeded to kill it with his spear. Then noticing that two high elves in the party he immediately started sniveling, trying to curry their favor. He invited the party to dine with him at the manor house, the group accepted needing a place to rest. There they found a decrepit wooden manor house. With mold and moss growing on the walls everywhere. The great hall wasn't much better except for the lord's chair. The ale was two days too old, the mutton tastless, and the cheese partly green. In addition the knight was unkind to his servant particularly his cook Matilda. After offering lodging in the great hall, the knight went to bed. At dawn the party awoke and the knight remained in bed. Matilda greeted them with fresh bread and breakfast far better than the previous night fare. When asked about her situation, she explained that she was debt bound to the knight in the tune of 100d (sp). The party became determined to free this woman. They had the knight woken and convinced him that it would be in his interest to be "friends" with the elves. That they wish to pay off Matilda's debt and retain her services. At first the knight tried to overcharge them and get 200d. With Sidwin's silver tongue and Ara asking him point blank does really want to be remembered among the fair folks as dickering like a Dwarf, the knight brought the price down to her true debt of 100d. Rested, the party ventured into the wild hills and sought the goblin cave. However the goblins discovered the dead sentry and now sent out patrol. One of which managed to waylay the party. Keyar, scouting ahead, was the unfortunate victim of their ambush. With two arrow shots, Keyar was shot down once more, confirming that he was indeed the right choice to play Boromir. Ara spotted them during the ambush and summon forth a Ray of Frost. But the site of his new compatriot must have shaken the elven wizards as the spell missed. The goblins bolted and Vognur and Ara gave chase. After a few tense seconds, Sidwin managed to stabilize Keyar. The goblin chase was short as they ran afoul of a bear. In trying to avoid the animal they doubled right back to their pursuer and Ara downed them with a sleep spell. The goblins were killed and the two returned to the party to find Kaylar up, taking the knee to summon up his reserves to make the final push onto the goblin cave. A half hour later the cave was in sight. This time the party halted a hundred yards out. Sidwin and Kayar carefully picked their way through the thicket. This time luck was on the party's side and they caught two more sentries unawares. Within six seconds they laid bleeding out on the ground. With that we called it a night and the epic journey to the entrance of the goblin cave was done. Man goblins stealth is nasty. While I was lucky in my rolls the +6 they get really makes goblins deadly when they have time to prepare. The group had some great moments roleplaying. With the PHB coming out next week I might have to turn this into a full campaign and put it into the Monday Night rotation. 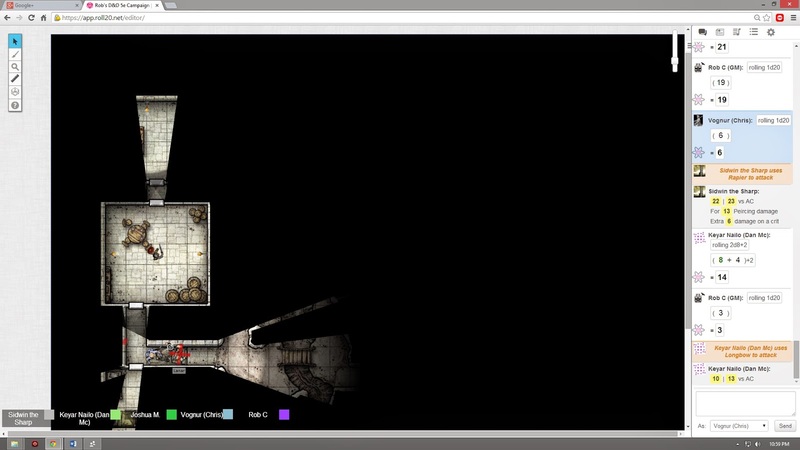 The only bummer is that we didn't get to experience Roll20's dynamic lighting. There also a technical hiccup where I tried to use the new Line of Sight feature. The problem turned out to be that you not only have to enable Line of Sight for the map. But tell Roll20 that the characters had sight as well. The screen was black because I left the character blind. But we got it sorted it out and next week looks to be a great game. I also played 5e at Gold Star Anime with a much larger group. While it is too early to be conclusive, I think spotted a quirk of 5e. That the effectiveness of larger groups isn't a linear progression, it is geometric. The group had 10 players and despite adding four times the creatures they still had a far easier time of it then the Monday Night crew. We will see how it goes. So far 5e is a very solid system and even tho the party remains stuck at 1st level. They are able to recover from disaster and continue to progress. Soon we should see how higher levels fare. I hope. While answering 5e questions over on RPG Stack Exchange, I noticed something interesting about the DnD 5e Basic PDF. They don't spend a lot of wordage on what you shouldn't do, deliberately leaving things in a way that is open for interpretation. An arcane focus is a special item—an orb, a crystal, a rod, a specially constructed staff, a wand-like length of wood, or some similar item—designed to channel the power of arcane spells. Note the a specially constructed staff, a wand-like length of wood, and especially or similar item. A player asked me whether his elven wizard could use his bow as a arcane focus. My ruling was that yes it could provided you paid the cost as outlined in the price list. And with the understanding it doesn't allow you to use it as a weapon when you are casting a spell. In other word you couldn't finagle it so you can cast and attack without another rule or ability coming into play. I posted this on Stack Exchange. And got two answers. The more popular answer was that RAW doesn't allow it. The other answer was to embed a crystal that is a Arcane Focus into the bow. What I found interesting that the popular answer assumed that if it was not permitted it is forbidden. I looking through various forum posts and google+ posts I seem many answers to rules questions are like that. And then reread the Basic PDF. And that not how it come across. The tenor of the rules is to present options at every point. To make the game your own. For me personally I viewed the list of Arcane Focuses in the price list as a sample implementation of the rule on page 48. It is there not to limit what Arcane Focuses are but rather to give you something that ready to play out of the box. Not to say there are not hard and fast rules in the Basic PDF. For example the fact you roll a 1d20 for your initiative is pretty straightforward. But in the backgrounds, various aspects of the characters classes, and other areas of the rules, the vibe is one of making it your own. In the end I think Mearls and his team did a good job in balancing hard and fast rules with the stuff that can be interpenetrated in a variety of ways. The key takeaway is that if you are starting out with DnD 5e, look at the rules as guidelines for your own campaign. Don't get trapped in thinking that DnD 5e is meant to be run RAW in the way that 3e and 4e. Even if you don't want to house rule much there is a lot of flexibility in how you implement the rules for your campaign. Particularly in backgrounds, and equipment. Over on the Hack and Slash blog and other sites discussing 5e there some talk on the Investigation skill. Perception. Wisdom (Perception) check lets you spot, hear, or otherwise detect the presence of something. It measures your general awareness of your surroundings and the keenness of your senses. For example, you might try to hear a conversation through a closed door, eavesdrop under an open window, or hear monsters moving stealthily in the forest. Or you might try to spot things that are obscured or easy to miss, whether they are orcs lying in ambush on a road, thugs hiding in the shadows of an alley, or candlelight under a closed secret door. The way I view it is that Perception is about knowing that something exists. Doesn't tell you anything about it other than the fact it is there and whatever information your sense gives you. Investigation is about deducing a larger picture from the things you perceive. In GURPS Perception would be coupled with a specific knowledge skill. For example you use perception to find a shiny golden rock and geology to tell whether it is fools gold or real gold. In 5e Investigation is what would be used in place of the Geology skill. I would recommend limiting Investigations to deducing any information on specific objects. Leave it to player skill to figure out the larger picture that connects the details that are uncovered. It very easy for a referee in a crime scene encounter to allow his player a Sherlock Holmes moment via a simple successful investigation check. I think this would take too much away from the experience of being there as the characters. They met earlier Miss White a older heavyset women. Met earlier Miss Black a young petite women in her 20s. Met earlier Professor Plum a middle aged man of medium height and rather thin. I would leave it up to the players to put this information together to deduce that it was Colonel Mustard in the foyer with the candlestick who killed Mr. Peabody rather than have them make another investigation check.